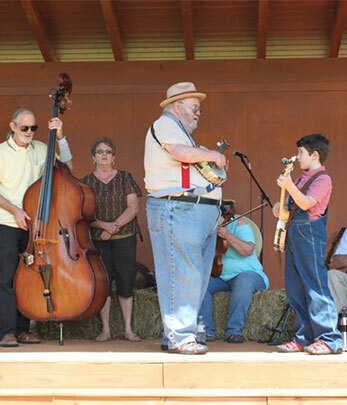 The 14th Annual Franklin Area Folk Festival, “A Celebration of Appalachian Heritage” will be held on Saturday, August 18, 2018 from 10 am to 4 pm at Cowee School Arts & Heritage Center. Nestled in Cowee West’s Mill Historic District at 51 Cowee School Drive in Franklin, NC, the Center is a unique showcase for demonstrating the everyday skills, crafts and music of our ancestors. And it is a FREE event! On August 18, 2018, the Cowee School Arts & Heritage Center will come alive with sights and sounds of our Appalachian heritage during the 14th Annual Franklin Area Folk Festival. Come learn about the culture and folkways of our mountains by engaging in one of the many living history experiences and heritage demonstrations, a trademark of this FREE festival. Plott Hound Exhibit and Walton War Exhibit will be on display. The Folk Heritage Association of Macon County and the Cowee School Arts& Heritage Center board jointly sponsor the Franklin Area Folk Festival with support from the Cowee Community Development Organization, Rickman’s Store, Macon County Historical Museum, Franklin Area Chamber of Commerce, Blue Ridge Heritage Music Trail/SEBA, the Arts Council of Macon County and others. 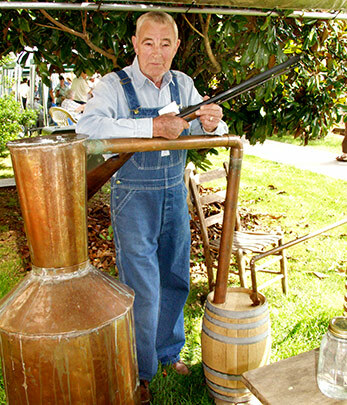 Come learn about the culture and folkways of our Southern Appalachian Mountains by engaging in one of the many living history experiences, a trademark of the Franklin Area Folk Festival, “A Celebration of Appalachian Heritage.” This FREE event is co-sponsored annually by the Folk Heritage Association of Macon County and the Cowee School Arts & Heritage Center with support from Cowee Community Development Organization, Rickman’s Store, The Scottish Tartan Museum, Macon County Historical Museum, Franklin Area Chamber of Commerce, Blue Ridge Heritage Music Trail/SEBA and others. 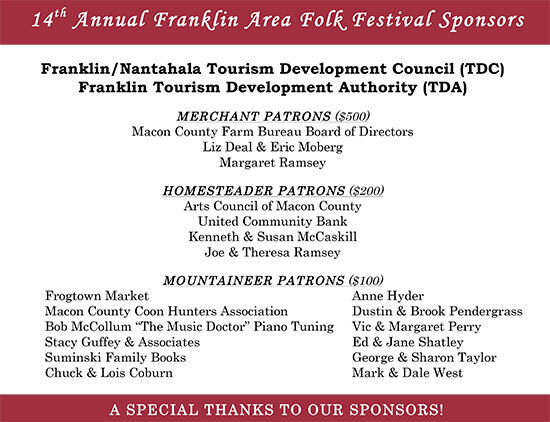 The festival is made possible by a grant from the Franklin/Nantahala Tourism Development Committee, the Tourism Development Authority of the Town of Franklin and the Macon County Arts Council along with funding from local businesses and individuals. For more information call (828) 524-6564. See Appalachian Artisans in action as they offer living demonstrations of their craft passed down from generation to generation. Always a popular attraction of the Franklin Folk Festival featuring dozens of antique rides located in Town with FREE Shuttle Rides. Re-enactors demonstrate life from the Civil War era including live artillery fire and skirmishes. See a Special Exhibit of the Cabarrus Quilt, Celebrate America Autograph Quilt, and more including the Smoky Mtn. Quilters Guild and Cowee Quilters. Hear local talent or play along, so be sure to bring an instrument if you play. Hosted by the Macon County Chapter of the Southeastern Bluegrass Association (SEBA). 100 Years ago there were no XBoxes. Your young ones can participate in free heritage activities and learn how kids of yesteryear passed the time. Look for Tartan Flags to identify children's activities.